Multi-vehicle accidents are far from uncommon on California's busy roadways. In fact, many of the hundreds of thousands of collisions reported in the state each year involve more than just two vehicles. It's not an exaggeration to say that Californians can hardly turn on the evening news or open a newspaper without seeing a story about a multi-car pileup and its tragic consequences. One recent California multi-car crash shut down traffic on both sides of the 15 Freeway through the Cajon Pass (at Oak Hills), after 19 vehicles—including delivery trucks and big rigs—collided during morning rush hour. The multi-vehicle wreck resulted in extensive property damage, and left 35 people with moderate to severe injuries. Victims hurt in multi-vehicle wrecks may be entitled to collect compensation for injuries, lost wages, pain and suffering, and more. Unfortunately, seeking a financial recovery for injuries and losses sustained in a multi-car accident can be challenging, as liability may be difficult to discern. After all, in a car accident involving two different vehicles, determining liability is usually a relatively straightforward process. When three or more cars are involved, however, the process of deciding which driver or drivers are at fault becomes much more complicated. At the scene of the crash, the first priority will always be obtaining medical attention for anyone who suffered injuries. After immediate medical needs have been attended to, the law enforcement officer or officers at the scene are supposed to take statements from all drivers and applicable witnesses. This begins the process of establishing whether someone, or more than one person, violated any traffic rules which caused injuries and property damage. The law enforcement officers, sometimes, but not always, determine who is at fault for the collision and whether one or more individuals should receive citations for violating the rules of the road. In very rare circumstances, it may be determined that no one is at fault for the crash. For example, a medical emergency or poor road conditions might set off a chain reaction that simply couldn’t have been prevented. There are several different possibilities for fault. One driver may be entirely at fault, two drivers may be equally at fault, or three or more drivers may share small percentages of fault. For example, even though one person makes the initial mistake that sets off a chain reaction, the other drivers who fail to react because they are speeding, tailgating, drowsy, or distracted all share responsibility for the seriousness of the collision. California is one of several states that uses a “pure comparative negligence" rule when determining your eligibility for personal injury compensation. Essentially, this approach means that your compensation will be reduced by your assigned percentage of fault for the accident. For example, if you were 20 percent at fault for the accident and awarded $100,000, you'd only receive 80 percent of that total—or $80,000. Multi-car accidents can lead to substantial expenses. When several different parties are injured, it is easy for the medical expenses, lost wages, and pain and suffering to exceed policy limits. 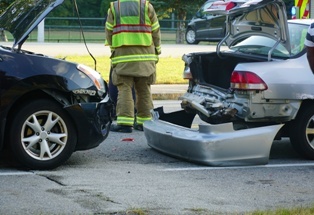 An accident involving three or more vehicles is also more likely to result in severely disabling injuries such as amputation, paralysis, or traumatic brain injury. In cases where victims are left permanently disabled, the anticipated cost of their future medical care and the loss of earning potential they have suffered may be the most expensive parts of the claim. Although it is strongly recommended that drivers carry more than the minimum legally required insurance, many do not due to budgetary constraints or a mistaken belief that they are safe drivers who will never be involved in an accident. When policy limits are exceeded, your remaining options will be to try to collect from the at-fault driver and his or her personal assets or turn to your own uninsured motorist coverage if you properly insured yourself before the collision. California allows drivers and injured passengers two years from the date of the accident to file a personal injury claim. However, it is strongly recommended that you contact an experienced personal injury attorney as soon as possible after the crash. The longer you wait, the more difficult it can be to collect the necessary evidence to support a settlement that adequately meets your needs. The experienced legal team at the Inland Empire Law Group is committed to helping California residents receive the compensation they need to move forward with their lives following a multi-vehicle auto accident. Please call (888) 694-3529 today to schedule a free, no-obligation case review. For your convenience, appointments are available at our Rancho Cucamonga and Victorville locations. When Should I Hire a Lawyer for My Car Accident? Why Do People in the Same Accident Often Suffer Different Injuries?